Personalized Basic Oval Address Plaque - - aluminum sign holds a name or house number with up to five characters. Made in USA. Petite 7.5" x 3.5" oval holds up to five 2" characters (large image). Standard 12" x 5.5" oval holds up to five 3" characters (small images). 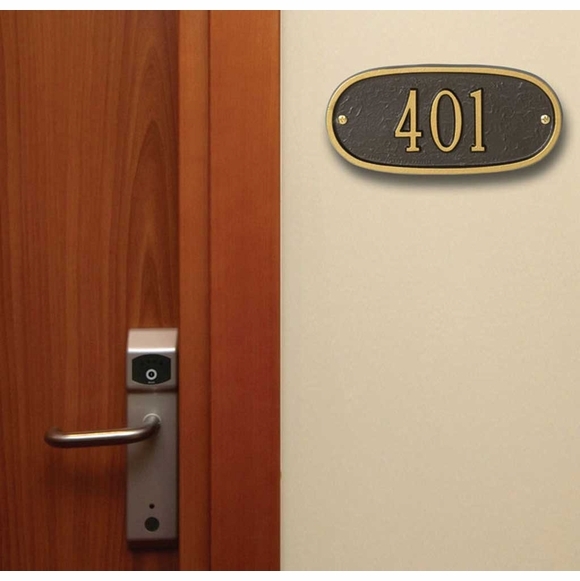 The petite oval marker is also suitable for use as an entryway plaque in multi-unit complexes, apartment buildings, condos, lodges, inns, hotels, etc.